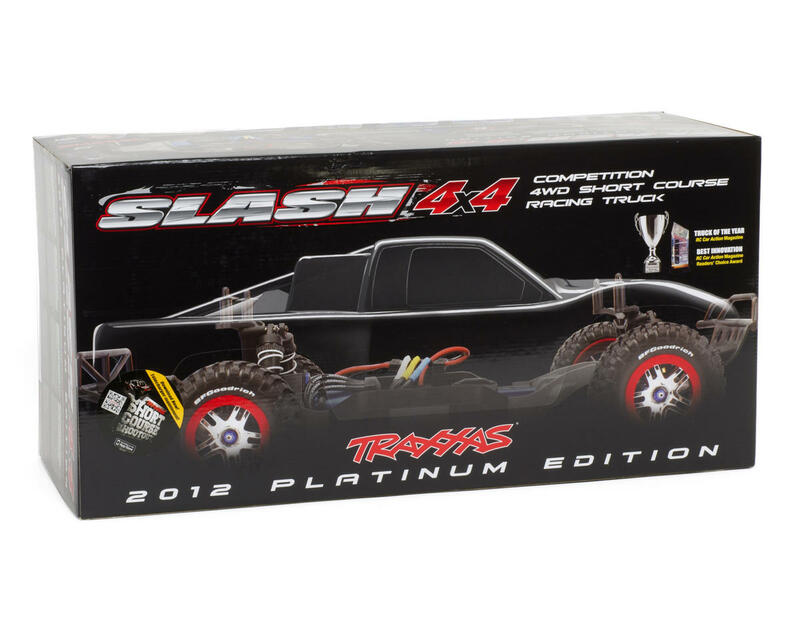 This is the Traxxas Slash 4X4 "Platinum" Edition Brushless 1/10 Scale 4WD Short Course Truck. The next-generation Slash 4X4 Platinum Edition pushes the performance envelope farther than ever with a redesigned Low-CG chassis that delivers superior handling, maximum corner speed, and lightning fast steering response. Higher speeds make the suspension work harder, so the Platinum Edition includes GTR hard-anodized aluminum shocks with PTFE-coated 13mm bores and titanium-nitride shafts for smooth, consistent damping lap after lap. The Platinum Edition then checks off nearly every box on the Slash 4X4 option sheet to deliver the ultimate in short-course racing performance. The final touches are up to you; Slash 4X4 Platinum Edition is fully assembled and ready to complete with your radio system and battery, and the clear body let’s you apply your signature style. GTR Shocks: The hard anodized GTR shocks feature PTFE-coated 13mm bores for ultra-smooth damping action. Electronics: The proven Velneon Brushless Power System is LiPo ready with built-in Low Voltage Detection. 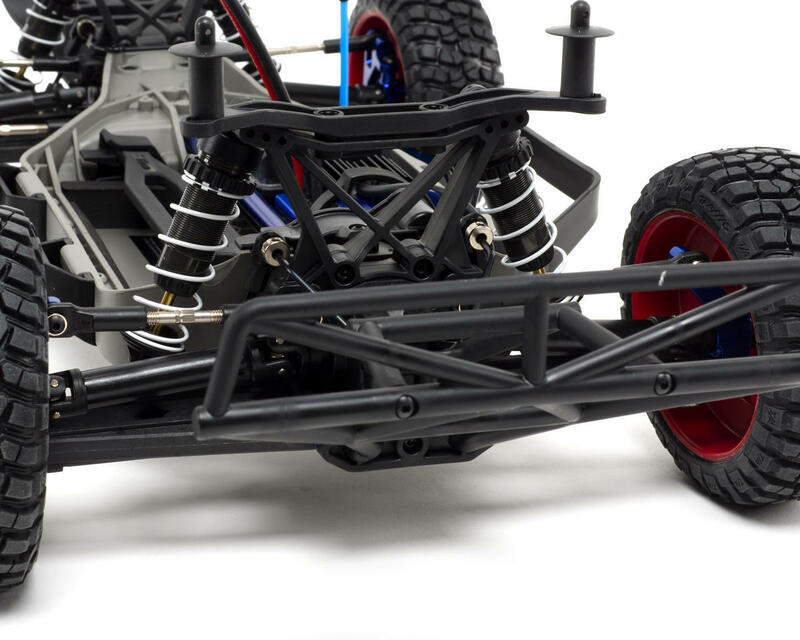 Aluminum: In addition to everything that already makes the Slash 4X4 great, the Platinum Edition adds blue aluminum C-Hubs, blue aluminum Steering Blocks, blue aluminum Rear Hub Carriers and blue aluminum Axle Nuts. Body: The Lexan body shell comes clear from the factory. This lets you apply your signature style or paint scheme the way you want it. Choose your own radio system and battery (not included). I had an HCG Slash 4x4 when they first came out and sold it a while back. Needless to say I missed the reliability, so I bought this little guy just to have around for fun and the occasional sportsman race. 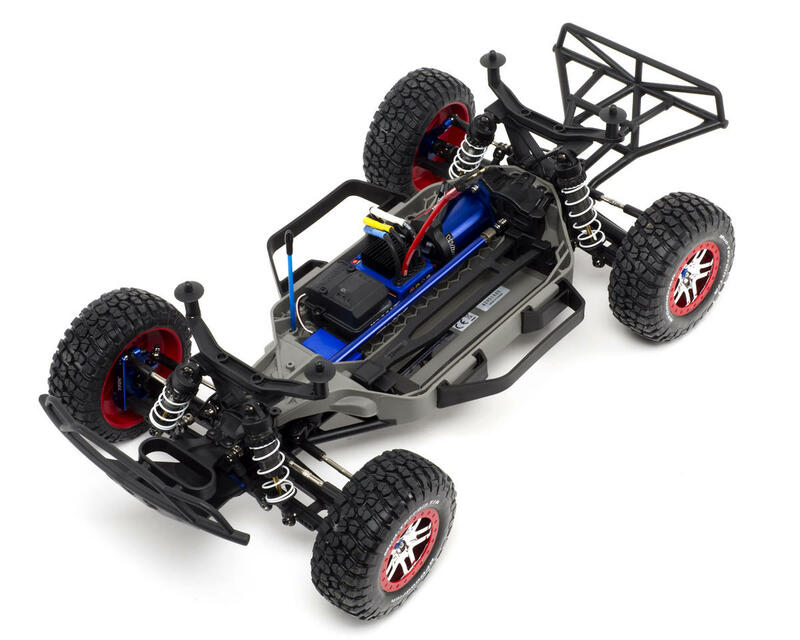 The LCG chassis and GTR shocks are a HUGE improvement over the initial release of the slash 4x4. 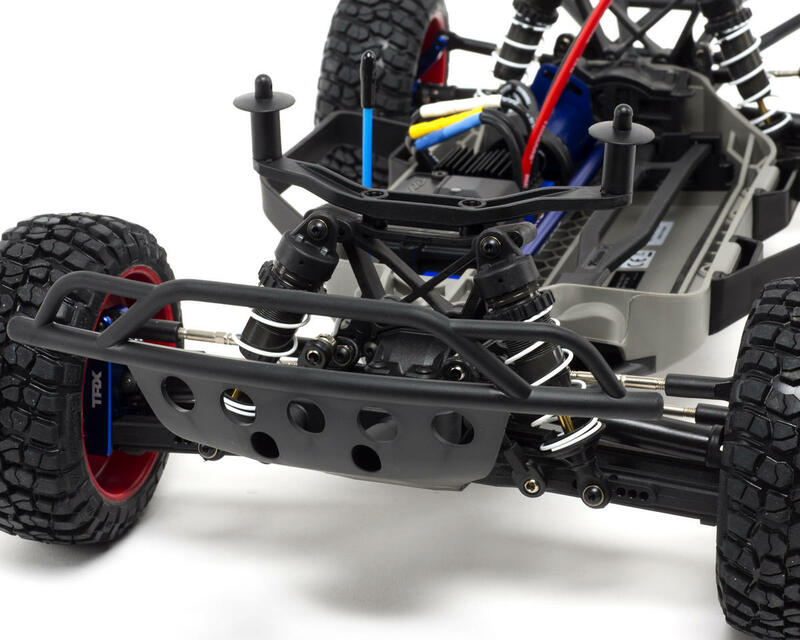 It handles exponentially better and the shocks are pretty close to perfect stock, just set your ride height, install the included center differential, and you can actually compete with this new Slash. Ok, maybe you want to invest in some real tires, but everyone knows how bad the stock tires are for race traction. Good for bashing though. For the beginner to intermediate, this is a great truck to bash during the week and race on weekends. The pro would want to make a few more changes and tune it so it can still be competitive with the purpose built race trucks. Also, all the hardware is metric instead of annoyingly having mixed metric/SAE like some other silly trucks. It is possible to race with this truck. I bought it because I wanted a 4wd sc and I already had a few Traxxas cars so parts were available. I added a fan to the esc, new tires and swapped out the slipper for the center diff. The motor has just enough power to get the truck going but don't expect to be the fastest guy at the track. I switched the diff oils to Traxxas 30k/50k/10k and it behaves itself around the bends with minimum under steer. I've had the truck since late April '13 and have only broken 1 piece while racing every weekend. A rear shaft broke at the knuckle in a mash up in a turn. It's a great truck. It's competitive out of the box but its not as fast as the losi or tekno. It can be just as good as them if you swap out the motor, esc, all drive shafts and learn to drive. I have no idea how it does bashing, I've never tried. I'd assume its alright there as well. This is my first Electric RC. For years I was a nitro person, I had several buggy's from Red Cat and Losi. 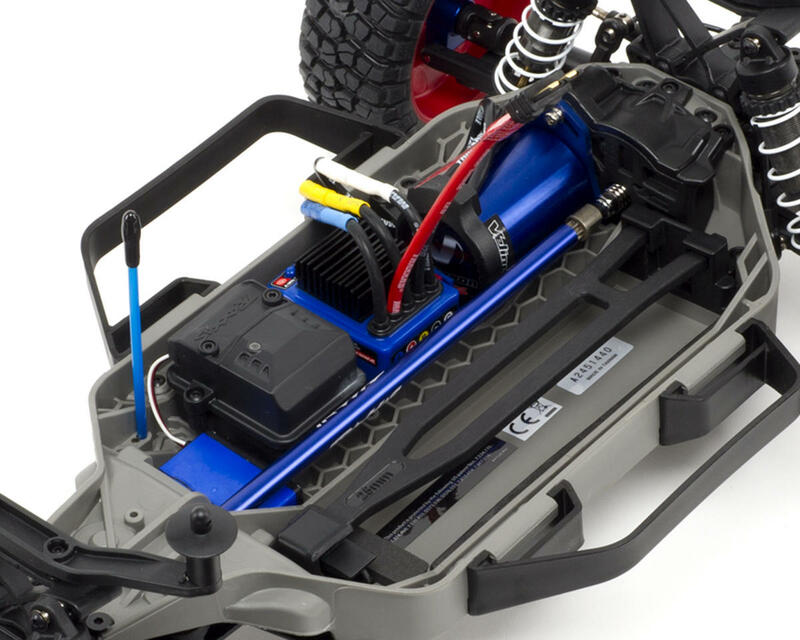 I spent several months doing my research on the different types of Electrics RC's and I kept coming back to the Slash 4x4. I decided on the platinum because I wanted something rugged, durable, fast and does not need a lot of upgrades. I absolutely love this thing! I am using 2 Lipo 7600 for max run time(about 25 mins each), it is plenty fast! I have beat the crap out this thing! I run it at work in a parking structure, at home in the grass and dirt at the nearby park. I have broken the lower arms due to missing a jump and crashing into support pole head on. I replaced the arm with the RPM version due durability of the parts. The simplicity and functionality of electric as compared to nitro is absolutely fantastic. Less time consuming and more run time. It works extremely well and I am very pleased with the purchase. This is my first traxxas, and i must say, im impressed, the reliability, durability and performance is more than i ever expected. I used it to bash at my local park and i really love it, very fast, and great on jumps. The stock tires pair nice with this car if your bashing or want to drift on short grass at high speed. Chuck in a 3s lipo and watch this thing go sideways on short grass, really fun to watch and drive. This car is for the pro and the beginner, 5 stars. I bought this truck and I fell in love instantly on my first run. I already had a radio, battery's, and everything else I need. The only thing I did was stiffen the shocks up but that took a minute. I was gonna go with another version until I seen this had the new brushless system, upgraded aluminum parts, gtr shocks, and a couple of other little things. I would definitely recommend this truck to any basher that does not want to spend too much on a truck that's gonna get beat up. A couple of thing that you might want to get are aluminum drive shafts, different tires, and a chassis cover(it gets nasty). All in all this is definitely my favorite car for the price! So I've owned this vehicle for about 2 years and for the most part it's been a great vehicle. The only things that have brok on it have been the bodies and that's due to my terrible landings when I jump. otherwise the only minor thing is it's not quite tune or built for racing and requires a lot of patience and tuning to get it competitive. Btw I strictly race mine now so that's probably why I don't break anything. Also I haven't raced it in months. I was interested in the Slash since I bought my T-MAXX 3.3 back in 2007. I skipped in then because I always just assumed for back yard bashing you would need a 4x4 monster truck. After getting this truck and pairing it up with a Traxxas #6533 (TSM 5 channel) receiver and my TQI 2 channel radio I hit the yard for a little bashing. HOLY cow - it will be awhile before I pull the stampede, T-MAXX 3.3, or anything else out of the garage again. With 5000mah 2S Lipo is just slightly slower than my tuned T-MAXX 3.3 however where the T-MAXX only runs for about 10-12 minutes on a full tank this things runs for ~19 minutes full out bashing, jumping, crashing......it's a winner! If you want a good run time buy 3 5000mah lipos and you can drive till you're sick of driving! The extra parts that the platinum version comes with, if bought separately, would cost you ~$200 which makes this truck a steal if you already have a TX/RX or don't mind buying one. With the TQi system and training mode you can let even unexperienced drivers play around with it, or with a bluetooth enabled one tweak to your hearts content to let even the smallest child or inexperienced driver have a turn. On A-Main's side, everything went perfect. Packaged very nicely/safely and received earlier than expected. On Traxxas's side, the truck is durable, very durable. This can take a tremendous amount of abuse, and a little more. Although before using it and running it, get yourself some shock oil since the GTR shocks are built HORRIBLY from the factory. After the shock rebuild, truck handles great. All the upgrades in this Platinum edition are needed when compared to the stock version. 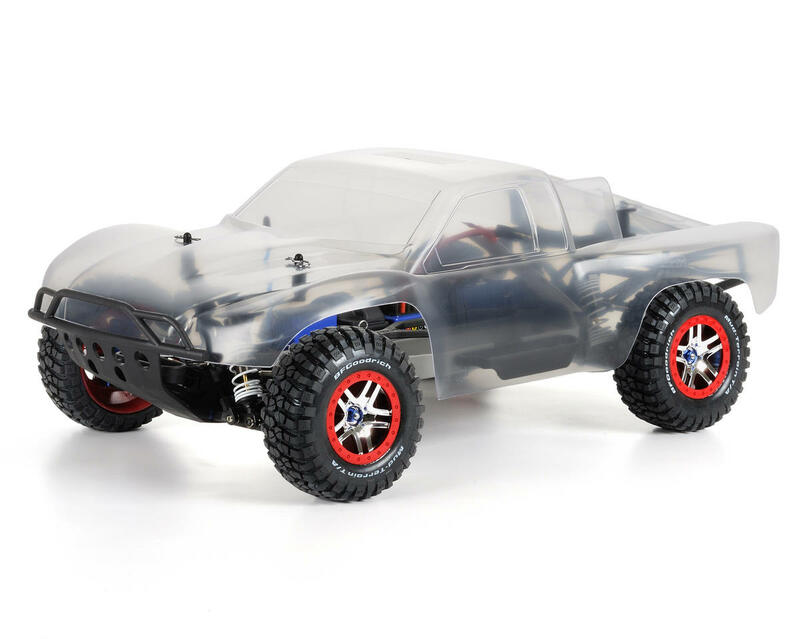 The Slash 4X4 LCG is a very good basher, and it can somewhat be up there in "Friday night racing" at you local racetrack. The rougher the track gets, the better the truck feels. If you are thinking of getting one, don't hesitate. You won't be disappointed. Don't expect a racer, but rather a tank that can plow through everything you throw at it. This truck doesn't work for me on the desert terrain of dirt sand and gravel so I'm a little disappointed. The tires are no good so it doesn't handle that good for me and the chassis quickly fills up with dirt sand and gravel and it cuts the hell out of the front driveshaft I have to keep stopping and turning it upside down and shaking it so it's a little disappointing. So what I did was put on some road Tires and wheels and changed the body out to the proline 66 Ford pickup body dropped it down low and it makes a cool pavement screamer! So as a off road truck for me the Lizard gives it a 3 but for on road I give it a 5. Great vehicle for the miney has a bunch of upgrades out of the box would highly recommend it to any new person that wants to get into the hobby but would upgrade the steering servo immediately because mine burned up in 4 days of running! These pics should be updated. Overall, it was a pretty good deal! I've purchased the first genertion Slash 4x4 Platinum Edition when it was out. I had no intention of ever racing so I wanted to get as tough as a truck as I could that was also waterproof which the Platinum Edition fit the bill as it had some upgrades already done to it. I kept it for about 2 years and ran it only on 3 with the same stock electronics. I got tired of it and a buddy of mine had an extra Kyosho Inferno GT1 Subaru WRC rally car body. I was the first person to convert the SCT into a rally beast. I had a blast with it especially 1/8 rally tires setup on a short course chassis that I internally limited. Eventually I sold it and missed the "I don't care if I wreck it feeling" so I got a good deal from my buddy who owns a LHS here in Houston. Sold all the junk Traxxas electronics this time and threw in a Castle MMP SCT edition along with the 4 pole 3800kv beast. Ran the only servo I had at the time which was a 5645mg. It was fine I wasn't going to need super fast turning I was only going to bash and jump. "Titanium" hinge pins are not true titanium....you can bend them in half with two pliers. Look for Lunsford for replacement of u do a lot of high jumps. I also found both differentials were filled with like a half grease half oil substance! What happened Traxxas?! After seeing all that I tore the entire rig down to make sure I Was not missing bearings, shims, screws, or anything that would cause disaster son. I immediately upgraded all A arms to RPM, all hinge pins to Lunsford, changed motor mount to the aluminum King Headz mount with a larger bearing, bought new basher trencher tires as well a proline's twist mount system and bought a new Silverado body. Looks like Traxxas is back in my life LOL. This SCT is great for kids or just bashing. The parts are super low qulity. If your excepting to race this truck invest your ca$h in a Tekno 410, or Team associated factory team 4x4 kit. The Tekno 410 makes the slash platinum look like a walmart toy. 6 of 28 customers found this review helpful.